Google Pack is a free download package offered by Google with collection of free software selected by Google. Web browser Firefox has been prominent part of this Google Pack. Now with Google’s own Chrome web browser, Firefox is being pushed out as default web browser. 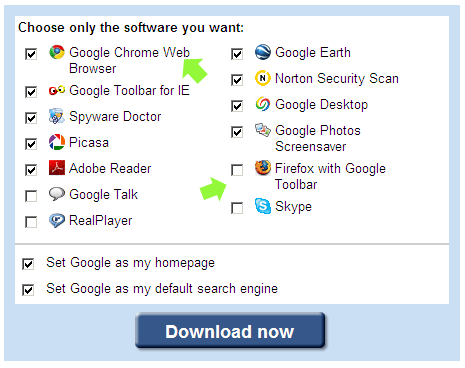 Google pack has Google Chrome as recommended software. Still keeping the face, Mozila Firefox with Google Toolbar is the last option in Google pack listing – just incase you bother to tick that option and download Firefox as well. This is clear indication, Google Chrome will getÂ prominence in all Google web services. Traditionally, Firefox has benefitted from Google’s Firefox promotion. Frefox is so big now, even Google packÂ boot out won’t have effect on it. As such, how many people download Google Pack? Another fact, Firefox is still way better than Google Chrome. Maybe this fact has left Google thinking and has kept Firefox in the pack as optional software – just in case!